Adams helps engineers to study the dynamics of moving parts, and how loads and forces are distributed throughout mechanical systems. Product manufacturers often struggle to understand true system performance until very late in the design process. Mechanical, electrical, and other subsystems are validated against their specific requirements within the systems engineering process, but full-system testing and validation comes late, leading to rework and design changes that are riskier and more costly than those made early on. As the world's most famous and widely used Multibody Dynamics (MBD) software, Adams improves engineering efficiency and reduces product development costs by enabling early system-level design validation. Engineers can evaluate and manage the complex interactions between disciplines including motion, structures, actuation, and controls to better optimize product designs for performance, safety, and comfort. Along with extensive analysis capabilities, Adams is optimized for large-scale problems, taking advantage of high performance computing environments. Adams Mechatronics is a plug-in to Adams which can be used to easily incorporate control systems into mechanical models. Adams Mechatronics has been developed based on the Adams Control functionality and contains modeling elements which transfer information to/from the control system. For example, using Adams Mechatronics in Adams Car, you can quickly create assemblies of vehicle systems including control systems, and then analyze them to understand their performance and behavior. Adams Flex provides the technology to correctly include a component’s flexibility even in presence of large overall motion and complex interaction with other modeling elements. Greater emphasis has been placed these days on high-speed, lightweight, precise mechanical systems. Often these systems will contain one or more structural components where deformation effects are paramount for design analyses and the rigid body assumption is no longer valid. 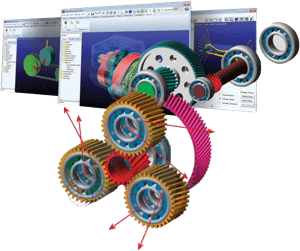 Adams Flex allows importing finite element models from most major FEA software packages and is fully integrated with Adams package providing access to convenient modeling and powerful post-processing capabilities. The ViewFlex module in Adams View enables users to transform a rigid part to an MNF-based flexible body using embedded finite element analysis where a meshing step and linear modes analysis will be performed.It is our new product module powered by MSC Nastran, allowing one to create flexible bodies without leaving Adams View and without reliance on 3rd party Finite Element Analysis software. Also, it’s a streamlined process with much higher efficiency than the way users have traditionally generated flexible bodies for Adams in the past. Durability testing is a critical aspect of product development and issues discovered late in the development cycle lead to project delays and budget overruns. Worse yet, “in service” failures lead to dissatisfied customers, safety issues, and warranty costs. Adams Durability allows engineers to assess stress, strain or life of components within mechanical systems to design products to last. Direct access to physical test data in industry-standard file formats enables engineers to use loads data captured during tests, and to easily correlate simulation and testing results. With Adams Vibration, engineers replace physical tests on shaker devices with virtual prototypes. Noise, vibration, and harshness (NVH) are critical factors in the performance of many mechanical designs but designing for optimum NVH can be difficult. Adams Vibration allows engineers to easily study forced vibration of mechanical systems using frequency domain analysis.